Anyone who wears foundation will know the struggle of not being able to find or afford the exact shade that matches your skin tone. I for one, have experienced the sinking feeling you get when you buy a new foundation and get home to see that it looks nothing like it did in the store. The Body Shop however took it upon themselves to create 2 new products to end every girl’s foundation woes and the only issue I have with it was that it wasn’t made 8 years ago! Buying foundation at the drugstore is the absolute worst experience for me as even though I love seeing what’s new and playing with all the different formulas, I can never seem to find my perfect match. My yellow undertoned skin is somewhere in the middle of caramel and light caramel but sadly, that shade only exists at MAC for R380 a pop. Because I am still studying (hello broke life) I definitely cannot afford to get a new bottle all the time while my collection of countless ‘too dark’ foundations roll around in my draw. I usually like to use the Rimmel Lasting Foundation mixed with a dot of a very pale Catrice base but still, never really seem to get my proper shade. 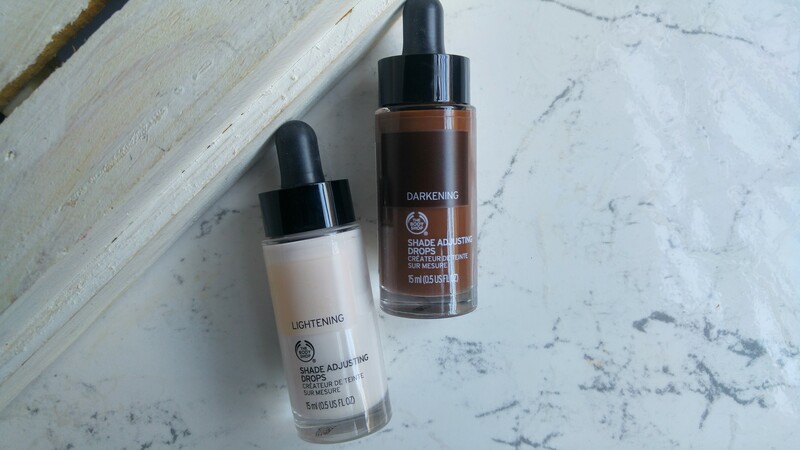 Last month however I got invited to the launch of the new Shade Adjusting Drops at the Body Shop (which I couldn’t make) and was so excited to see if they would work for me and hopefully give my other bottles of foundation a second life. Basically, the shade adjusting drops come in 2 colours, a very white, pale, almost milky shade and a really dark and rich chocolaty brown. Both are designed with a pipette which ensures that you don’t use too much of the pigment. It is sort of in the middle of a cream and liquid which does not at all change the consistency of your foundation. I do however find that you definitely have to be realistic about the shade spectrum you will get as you cannot expect your foundation to go more than maximum 3 shades lighter or darker than the original colour. I also wouldn’t recommend using the darkening drops if you are very pale skinned as it will make your foundation go quite ashy and grey. It does however make an excellent product for contouring the cheekbones if you are about olive to medium skinned. I tested the drops with 4 of my foundations which are all quite different textures and it worked for each one. The first one is the Rimmel Lasting Foundation in caramel- which is my go to foundation, is pictured below with a swatch of the actual colour and then with the foundation mixed with both the light and dark drops. I really liked that it kept the foundation quite creamy and didn’t at all thin it out after I mixed it through. The second foundation I used it on is the Maybelline Dream Matte Mousse in Caramel Dark 2 which is way too dark for me! Because this is a mousse foundation, you will need to scoop some out and either put it on the back of your hand or a plate and then add some of the body shop drops. I did however find that the texture of the mousse changed to a more liquid foundation but it applied as per usual and seemed to blend into the skin easier than before. I also found the application to be much better and so much easier that using the mousse straight up. The third foundation I tested it on is the Coverderm CC Cream in caramel brown which, like the mousse is also too dark for me (it actually goes to the point where it looks ashy). This CC Cream is really pricy and it hurt my heart to let such an amazing product go to waste so I was quite amped to see that the lightening drops really helped to tone it down and match my skin tone. Because the CC Cream is quite runny, the drops gave it even more of a liquid consistency which made application much easier. It does sheer it out a little bit which doesn’t at all bother me as a CC Cream isn’t meant to replace a foundation anyway. Finally, I also tried it out with my Rimmel Match Perfection Foundation in Noisette which is just one shade too dark for me. This one’s formula is a little less creamy than the Lasting Foundation but I love the coverage it gives. Happily enough, one pump of the foundation mixed with about 2 drops of the shade adjusting colour is enough to create my perfect shade (sadly I had issues with the photo but will try to retake it and update this post). All in all, I am thoroughly impressed with this product and love the versatility of it. I do however seem to have an issue with the pipette of the darker drops which sometimes lets air bubbles out, but that’s more annoying for me than an actual issue but, if you, like me, have a real hassle with finding your correct foundation shade and have too many ‘too dark’ and ‘too light’ colours laying around then I would highly recommend this product. Well done to the Body Shop! Would love to get these.